Yellowed armpit stains make a crisp white shirt look old and sloppy. Prevent further sweat stains on your white shirts or perk up garments that are already showing the telltale yellow underarm rings by adjusting your use of deodorant and using laundry pretreatments before washing your shirts. Oxygenating armpit stains before washing can help prevent permanent discoloration on white shirts. Use a solid antiperspirant deodorant and apply only a thin layer to your skin before putting on your white shirt. The International Hyperhidrosis Society explains that armpit stains form as a chemical reaction between your deodorant and the fabric. Gel-type antiperspirants are more likely to leave stains. Allow your armpits to dry completely before getting dressed, to prevent some of the product from rubbing off onto your shirt. You'll notice the transfer of the deodorant more easily when you wear a colored top, but may not notice it when your shirt is white. Rinse your white shirt in cold water before putting it in the washing machine. A prerinse in plain water removes any antiperspirant residue that might later cause a yellowish armpit stain to set during a normal washing cycle. 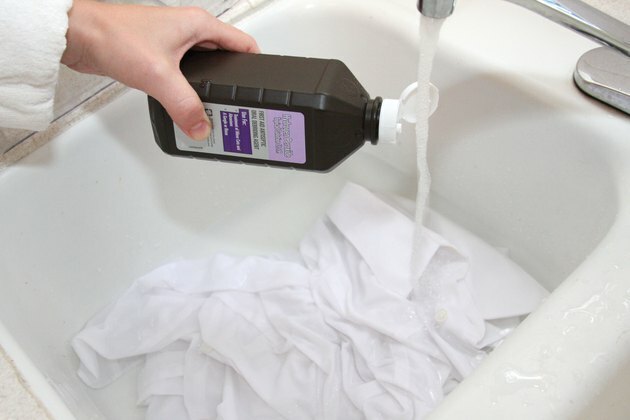 Soak your white shirt in a mixture of equal parts cool water and hydrogen peroxide to prevent underarm staining. 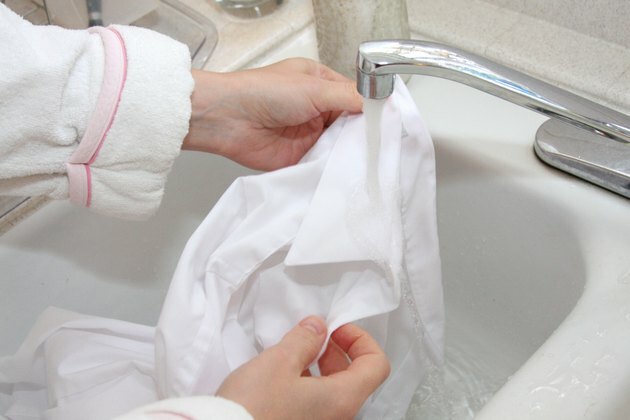 After about 30 minutes, rinse the shirt again in cold water and wash as normal. 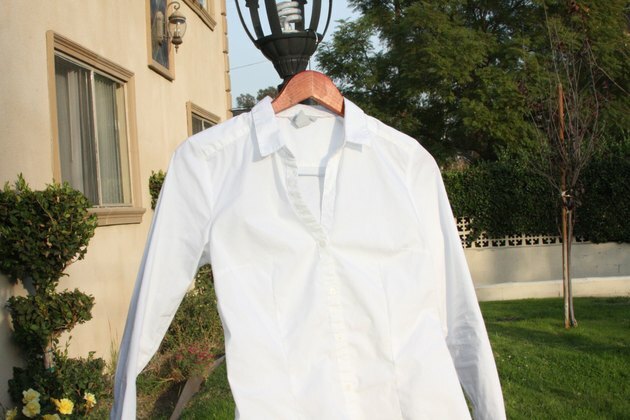 Hang dry your white shirt, either outside in the sun -- a natural bleaching agent -- or inside. The heat of the dryer will set any stains that might remain. When the shirt is dry, you can assess whether you have prevented permanent staining. If armpit stains have remained, soak the shirt again in hydrogen peroxide and water, increasing the peroxide to a bit more than half. International Hyperhidrosis Society: What would DRY mean to You? How Do You Clean White Baseball Pants?